Smartphone cameras have come a long way and taking a picture using one is probably the easiest way to click a decent quality imagery. However, taking pictures using a DSLR or a mirrorless camera is an entirely different motif. Simply owning a DSLR or a professional camera does not mean you are qualified enough to develop super quality images. It takes a lot of practice to finally become the master of the manual mode that seems like a rocket science to most of the beginners. Auto mode on every DSLR and mirrorless makes it easy to take pictures but certainly the images lack the emanation and quality. As a matter of fact DSLR manufacturers have really undermined the auto mode which would have had no hope until now. Arsenal is a device that according to Kickstarter, allows users to take beautiful pictures through DSLRs or mirrorless cameras. It is an AI device that mounts on camera and works out on all the essential factors that would otherwise take an individual months to learn about and practice. In simple words Arsenal takes perfect pictures once mounted on the camera. The basic pillars of manual photography are shutter speed, aperture and ISO. But these are not enough to take a picture that truly has the awe factor. There are several more settings on a DSLR such as light metering, background light, HDR, color correction etc that need to be accounted for. Arsenal simply takes care of these factors and pulls out great pictures that you have always wanted to click. Ryan Stout, the inventor of this intelligent device is an engineer by profession with expertise in AI. He had a very clear aim while coming up with this device. He wanted to take great pictures without having to adjust the knob for every miniscule setting that a camera has. 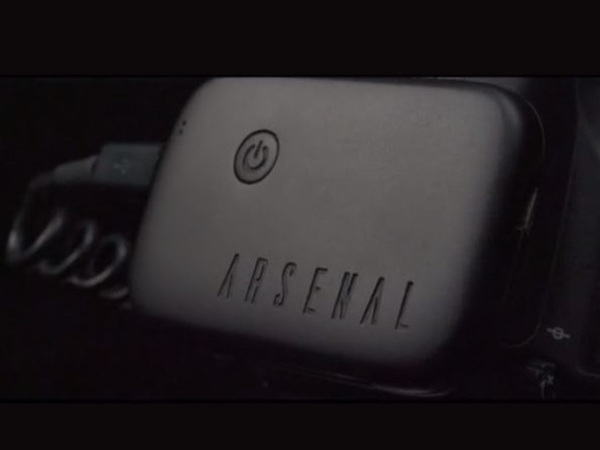 Arsenal is what he came up with, an easy to carry device that fits in pockets with AI supporting its reason for existence. Apart from the camera settings, this device all takes care of the ambient factors such as the wind speed, tripod stability, hand held stability, light conditions etc and works to pull out a great picture every time you click. What follows is the user base it will target and it genuinely targets beginners. It sure will strum and drang a camera enthusiasts' curiosity to make use of the device but manual mode experts will soon lose interest in it. Beginners on the other hand will never give manual mode a try with a device like this on their camera. Keeping in mind that professional photographers are basically perception artists, there are slim chances that any of the photography artists would want to give this device a place in their camera bags. The reason behind this assumption is well founded. A camera is only a medium to bring out an artist's perception to life and auto mode has never been a thing for artists. Commercial professional photographers may however put this device to good use. When working on a commercial project time is an important factor and so are the equipment being put to use. Arsenal might help in keeping these two factors accounted for, provided it really bring out the best quality. As suggested by Stout this device mitigates the use of certain light controlling equipments such as expensive filters. It also allows users to create time lapses and has a feature to remotely control the manual settings as well. The device is loaded with features that would attract intermediate photographers. As the case with this genre of photographers is, they are curious and equipment oriented. Arsenal is just another device for intermediates that would curb their curiosity and if this device is really as good as it promises it would provide them several pictures to boast about. There is yet another factor that really disturbs the ample fill of photographer that rests inside me. With Arsenal all you need to do is compose your picture and give it a click. It makes me wonder, where is the fun in that? What turns a beginner into a professional are the countless hours spent in flipping and switching between those settings. So yes it is a great device but only for camera enthusiasts and not the camera passionate. It is also a great device for travelers, bloggers and youtubers who have a major focus on their composition and cannot afford spending too much time on understanding and learning complex settings. The most fascinating thing about this device is the motivation it brings along with it for big players in the camera industry to look into the prospects of auto mode enhancements. With more and more people buying DSLRs and mirrorless cameras for safekeeping memories there is no better time to work in this field. The device is available on kickstarter and is awaiting production.